Hay Cap have 20 years of experience in the hay industry and decided that storing hay was an issue that needed to be addressed. 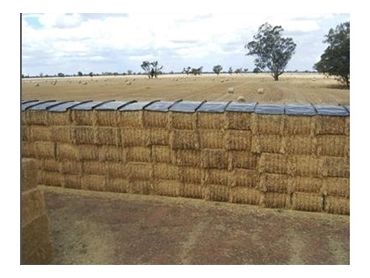 Hay cap covers were invented which are square covers made for large square bales of hay that can be applied from ground level. After stacking the bales on top of the hay, a roof is then formed. Made from a food grade recycled plastic the hay caps are easy to assemble taking less than one minute to put on. With a lifespan of over ten years, the Hay Cap allows you to store hay almost anywhere. In a quick, simple and effective manner. The Hay Caps are also vermin proof and UV stable. The award winning system has enabled farmers to protect their hay throughout the year.